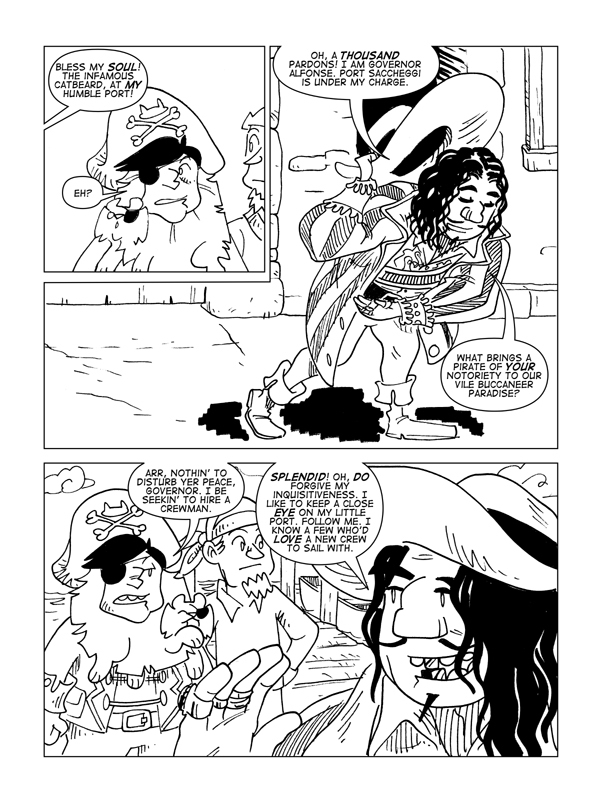 Earnin’ Yer Sea Legs, Page 3 – Catbeard the Pirate! Woo! Yeah! Now we get to see the lengthy pirate RESUME SELECTION process followed by ROUNDS AND ROUNDS OF INTERVIEWS! Yeah, you think I’m joking, huh? JUST YOU WAI–yeah, I’m joking. One thing I’m NOT joking about is the updates to the Store page! If you check out the Store you’ll see that three Catbeard prints have been added to the swag you could be acquiring, and there’s also a special bundle which gets you all three prints plus a copy of the book at a reduced cost with FREE SHIPPING! How could it get any better? Buy one for everyone in your family!